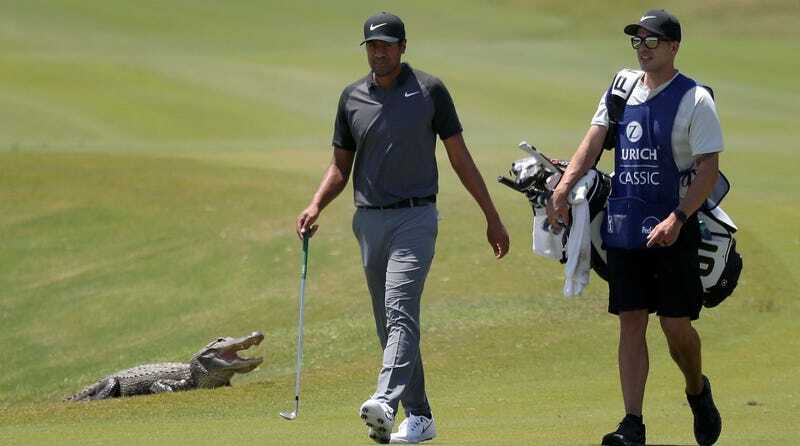 The Zurich Classic’s being played this weekend down in Louisiana, and the tournament features a few hundred golfers (okay) and approximately 20 alligators (great!). This little buddy was kind of interrupted by a Talor Gooch shot, and they tried to scare him off by throwing a rake towards him. He ate the rake. Gooch took a drop in the bunker, telling the PGA Tour’s site, “I like my life. I like it with all my limbs. So I stay away from those things.” Officials drove the gator away to the chagrin of the decidedly pro-gator crowd. They love the 18th hole! They’re great golf fans! There’s a history here.